They are literally disassembling the ballroom. Guys with power drills are talking down platforms and all the glitzy TV folks are long gone. It’s just me and some radio reporters and wire reporters. I swear, 30 minutes ago, there was glitz and glam, cameras everywhere and a real buzz in the air. Hollywood is all smoke and mirrors. 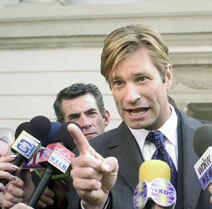 Pleasant surprises: “Thank You For Smoking” getting a best motion picture nod (comedy or musical) and the film’s Aaron Eckhart for best actor. Eckhart (pictured at top of post) rarely gets the recognition he deserves….America Ferrera nominated for best actress in a comedy series for “Ugly Betty,”…Alec Baldwin’s nod for best actor in a comedy series for “30 Rock,” Justin Kirk for supporting actor television (“Weeds”). OK, time to leave. The STAGE is being taken out, there is no food left and the lights are going out!